Why am I featuring tagua nut beads during Gemstone & Pearls month? Because I really like the concept of a renewable bead source, which gemstones definitely are not. And look at those colors! 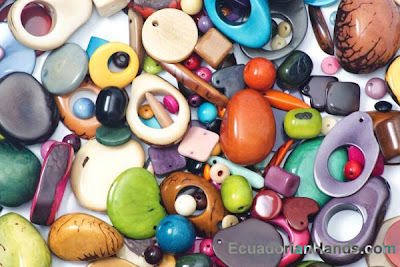 Would you like to win a nice selection of tagua nut beads from among those show above? I can't tell you exactly what beads you will get because they will be shipped to you directly by Ecuadorian Hands, but I'm sure they'll be wonderful! Just leave me a comment below and you'll automatically be entered to win. If you tweet or post on Facebook or other social spots about the contest, you can leave a second comment and be entered twice! Just wanted to thank you for sharing your wonderful ideas in design and creativity. I never get tired to your E-books. I love Tagua nuts, they are consider the "other" ivory! I would be thrilled to win some tangua nut beads. They are something I have never worked with. I am willing to try anything. I am making a necklace with electrical resistors right now & yesterday I used rubber o rings. I would love a chance to win some of their beads. I love the tagua nut beads. Just tweeted about the beads and giveaway. These are made from nuts? These are some of the prettiest nut beads I've ever seen. This is my first visit to your site and can't wait to dig deeper into your blog. I didn't know anything about tagua nuts before this, I went to their page and was reading about the process. Fascinating, I'll have to keep them in mind. Thanks for turning me on to some new materials! Thanks for the opportunity! I would love to win some of the Tagua nut beads. I have been wanting to try them out...I'm working on some pendants right now that they would be great for. I would love a chance to win some tagua nut beads. I would love a chance to win these so I can bring new material and medium into my work. I saw these in Ecuador and fell in love with them. I would love to win some. Oopooh, my kind 'o beads! Wow! Those are unique and fantastic. They look like they would be fun to work with. Thank you for offering this fantaztic giveaway!!! I love designing with these unique beads! Absolutely love the tagua nut beads! I think the tagua nut is finally coming out as the beautiful resource it is. I also have netsukes carved out of tagua. Very similar to ivory without the loss of life. I would love to be considered for this giveaway. Thanks! I must be living under a rock i have not seen such pretty ones before. I would love to win!! never seen these. would love to try them with my designs. thanks for the chance! Ohh does those all look yummy! I could do something different with them...enter me please! Will share on facebook as well! Okay so 1> I just shared on facebook in Creative Bead Chat and 2> I forgot to leave contact info in my last comment. What a happy, happy mix of beads. Bead party for one. Good Luck everyone. I would love to win these! The colors are amazing. gorgeous! I would love to add some of these to my stash :) cont me in please! i would love to create something with these beads! will share on fb. I absolutely love Tagua nut beads and buttons. They have such an interesting history and some of my favorite vintage buttons have been made from this wonderful material! I would love to win such a beautiful prize! These are very interesting beads. I would be thrilled to win them! I have recently started using tagua nut beads. I love it! Love the look of Tagua nut beads and the colors are so wonderful! Thanks for the opportunity to win some to play with. tagua nuts are so unique. thanks for showing them. What a pretty pile of beads! Thanks for the chance to win some of them!! Like everyone else, I would love to work with these! Have been wanting to get some. I would love to win the tagua nut beads, have never worked with them. Beading Arts celebrates Gemstones & Pearls month!